An undated photo of the former 3,000-bed Willacy County Correctional Center, which will now be used to house ICE detainees. RAYMONDVILLE — Buses carrying the first detainees are arriving at a new 1,000-bed detention center. Earlier this week, owner Management and Training Corp. signed a contract with U.S. Immigration and Customs Enforcement to hold as many as 1,000 adult undocumented immigrants at the former site of the 3,000-bed Willacy County Correctional Center. The facility is expected to hire about 150 employees, Issa Arnita, the company’s spokesman, stated. 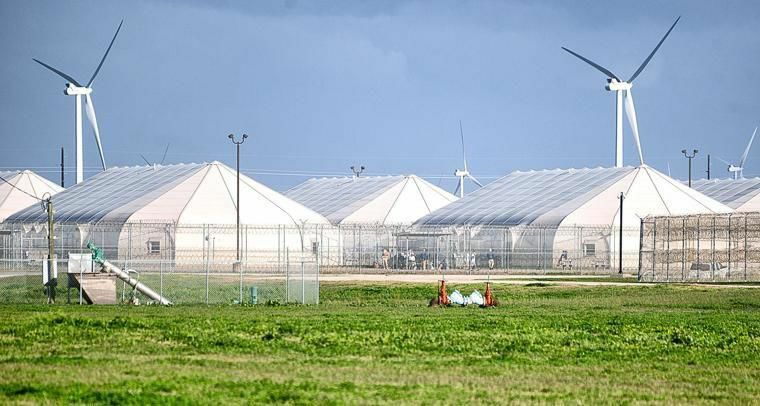 The detention center, which continues to hire, is paying officers hourly wages of $18.07, some of the better wages in this farming area struggling with some of Texas’ highest jobless rates. As part of an agreement, Willacy County will be paid $3 a day for every detainee held in the center. At full capacity, the center would pay the county a little more than $1 million a year, calculations show. “As you know, the last few years have been financially challenging for the county, so we look forward to this new facility and the economic benefits it will bring to our area,” County Judge Aurelio Guerra stated Wednesday in an MTC press release. Yesterday, Sheriff Larry Spence said MTC was apparently trying to hire some of the employees laid off more than three years ago. “They’re hiring and contacting a lot of people who had been there before to see if they’re still interested,” said Spence, whose department is conducting some criminal background checks. Some groups such as Austin-based Grass Roots Leadership and the Rio Grande Valley Equal Voice Network have criticized the county for signing an agreement with ICE. Earlier this month outside the Willacy County Courthouse, busloads of demonstrators protested MTC’s operation of the former tent-city prison. “At El Valle, we will provide detainees with a clean and well-maintained place to stay, nutritious meals, quality health care, access to legal assistance and the ability to communicate with loved ones,” Dan Joslin, MTC’s vice president of corrections, stated Wednesday in a press release. “We have worked for decades to help people facing adversity by providing education and training programs, integrating parolees successfully into the community, helping developing countries build successful workforce development programs, and providing quality health care to people who may not otherwise receive it,” Joslin stated. For more than three years, the Willacy County area has been reeling from the closure of the Willacy County Correctional Center, which paid the county for every inmate it held. In February 2015, rioting inmates destroyed much of the so-called “tent-city’s” sprawling tent-like domes, sparking 400 employee layoffs while slashing a third of the county’s $8.1 million general fund budget. Ever since, county officials worked with MTC to land a contract to bring some of the area’s better paying jobs back. MTC’s new contract marks the second time ICE has held detainees here. In 2006, the $60 million 3,000-bed tent-city opened as an MTC-run detention center holding ICE detainees. However, under ICE, the detention center fell far short of developers’ plans, with the agency filling about half of tent-city’s beds. By June 2011, ICE had pulled out, leading to the 120 layoffs. Then, developers proposed the Federal Bureau of Prisons take over the facility. Soon, the BOP had turned the facility into a minimum-security prison, nearly filling its 3,000 beds with undocumented immigrants convicted of crimes. On Feb. 20, 2015, rioting inmates destroyed much of the facility largely made up of 10 Kevlar tent-like domes. In March 2017, the county sold the 53-acre prison site to MTC after bond holders demanded payment of a $68 million debt. Last year, MTC, which operated the facility since it opened in 2006, removed the sprawling tent-like domes while repairing the remaining 1,000-bed concrete housing unit on the 53-acre property surrounded by two high razor-wire fences.